The annual FIBO muscle extravaganza took place in Essen Germany, in May 2003. The highlight was the All Stars stage and their ‘Show of Strength’ posing shows. 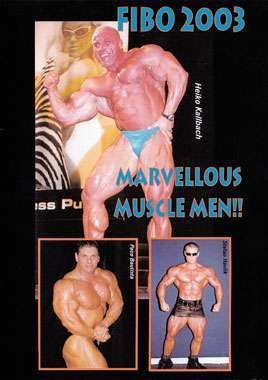 The annual FIBO muscle extravaganza took place in Essen Germany, in May 2003. The highlight was the All Stars stage and their “Show of Strength” posing shows. This year we had a slightly different format as we follow some of the stars from pumping and oiling back stage to posing on stage and working out in the weights area. PLUS THE ALL-STARS “Show of Strength“ physique event. Also see SHAWN RAY, DENNIS JAMES and much much more!! Click here for the COMPLETE INDEX OF FIBO DVDs.